The last place I expected to see a collection of Hollywood originals and reproductions was at a shopping mall in Meriden, Connecticut. I was there to produce and commentate a fashion show to publicize the opening of a new department store. Also there to entertain was singing star Shirley Jones of Oklahoma and The Partridge Family fame. 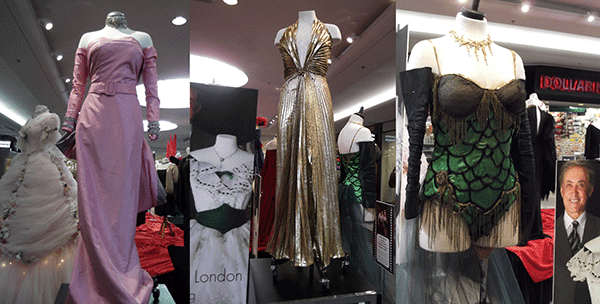 Still another attraction was Gene London, an expert on Hollywood fashion and costume collector. I first met him in the '80s when I interviewed him for a TV show. 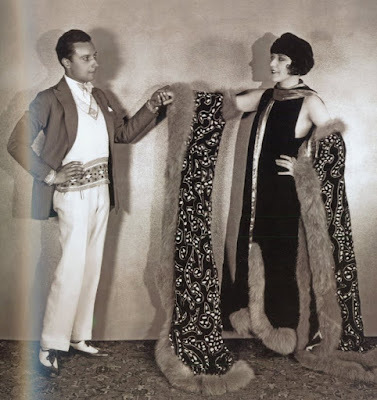 He was then the proprietor of “The Fan Club,” a huge retro clothes shop (some 60,000 gowns and accessories). 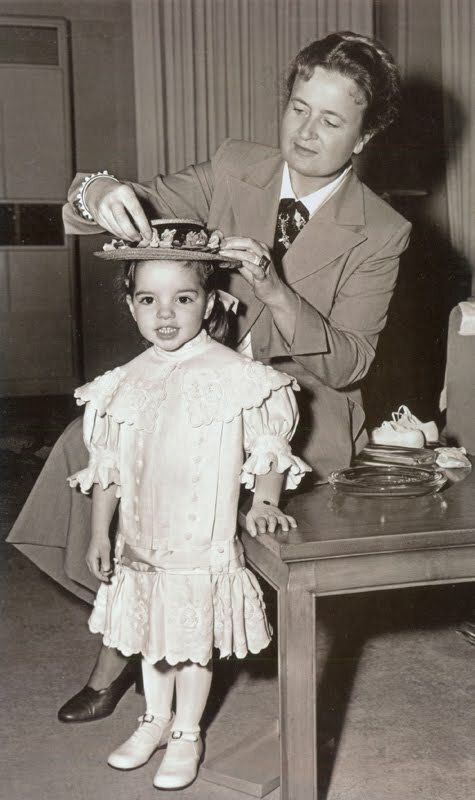 Gene, now age 84, was the star of a kid's TV show in the ‘'50s and he still exudes show biz pizzazz. He had a few models to bring to life his talk about vintage Hollywood star style. 100-plus impressive items were on display in the mall lobby. It was great fun to see such glamour close-up in such surprising surroundings. 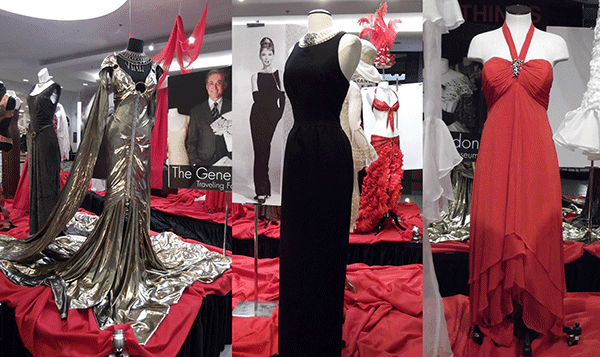 There was Marilyn’s notorious subway dress, Ginger Roger’s bugle-beaded gown, Esther William’s swimsuit, Jean Harlow’s slinky satin, Grace Kelly's Oscar gown and several Gone With the Wind costumes reproduced by Gene for Turner Classic Movies to celebrate the film's 50th Anniversary. Gene London and me, Gene with model in Crawford's gown, Marilyn Monroe's subway dress. I'm usually so busy with paper doll projects that I seldom venture far afield, artistically. However, once a week, I go to a life drawing workshop sponsored by the Leslie-Lohman Gay and Lesbian Art Museum in Manhattan's trendy SoHo district. I find drawing a live model sharpens my eye and thus, greatly benefits my paper doll projects. For a recent fund-raiser, the workshop's artists were asked to create little (5"x5") artwork for a special exhibition of "little pictures" all priced at $60.00 each. 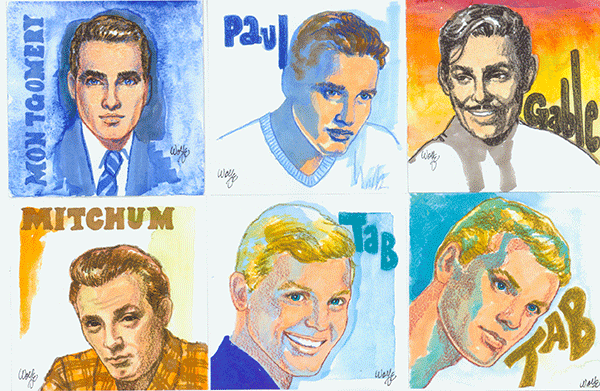 I created little pictures of male movie stars. Big subjects, though, for sure. The exhibition, hundreds of little pictures by several dozen artists, was a great big success. Of course, I was the only artist to portray movie stars! Justin Trudeau, the hunky new Prime Minister of Canada, recently popped up as a paper doll by Kyle Hilton in New York Magazine, Nov. 2, 2015 Issue. 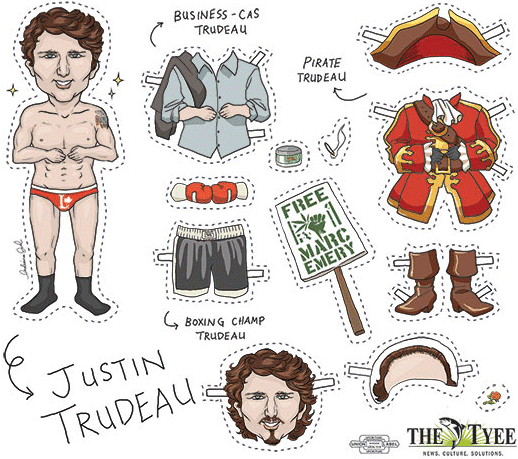 For a more cartoon-like PD of Canada’s new PM, visit http://thetyee.ca/About/National/Paper-Dolls/. 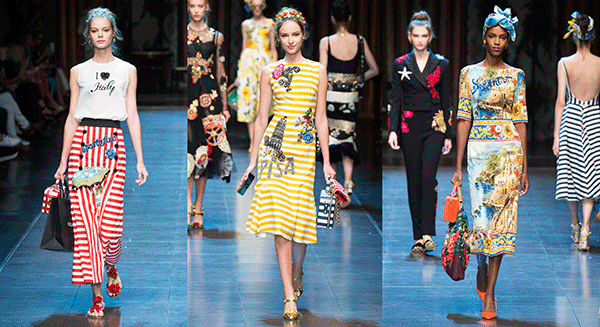 Fashion is rediscovering fun with light-hearted prints and appliques. 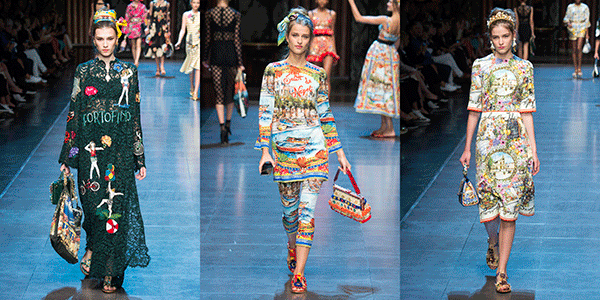 While some designers are delving into kitsch motifs, for spring ’16, Dolce & Gabbana are tripping with an Italian travelogue, featuring prints and appliques inspired by vacation destinations. Roma, Portofino, Pisa, Napoli, Sorrento and other fun spots are depicted with naïve appliques (often on sheer materials) or rendered as ornate scenic views inspired by antique postcards. Such a good idea is bound to be reinterpreted with other destination locations. Buon viaggio! 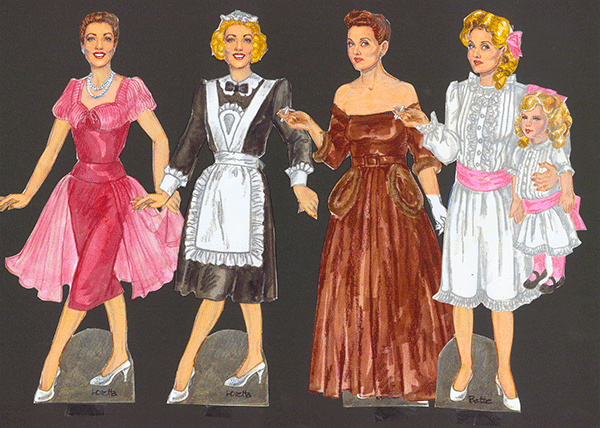 When researching costumes for my Classic Drama Queens paper doll to be published in February, 2016 by Paper Studio Press, it struck me that almost all the stars in the book share a duality. Each one is inherently glamorous and usually appears dressed to the nines, gorgeously gowned and dripping in furs and jewels. Glamour may be big box office, but it usually won't get a gal that coveted gold statuette. Playing a dowdy, down-and-out, desperate character is more likely to rate an Academy Award nomination and sometimes a win. 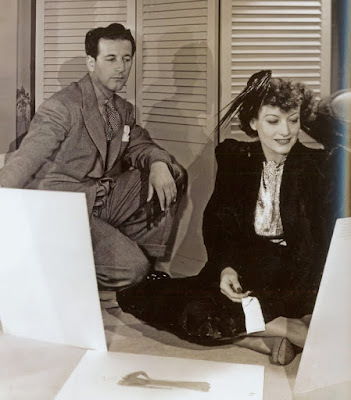 Mildred Pierce, a poor housewife/waitress/restauranteur won Joan Crawford a surprise Oscar. Loretta Young got hers for playing a simple Swedish sweetheart in The Farmer’s Daughter. Irene Dunne's nomination came for playing a stout (padding!) stalwart immigrant in I Remember Mama. Garbo’s world-weary Anna Christie got her out of Adrian’s glamour gowns and garnered a nomination. Bette Davis often shed glamour for glory such as her unforgettable portrayal of a has-been child star in Whatever Happened to Baby Jane? What happened to Baby Jane was another Oscar nomination. 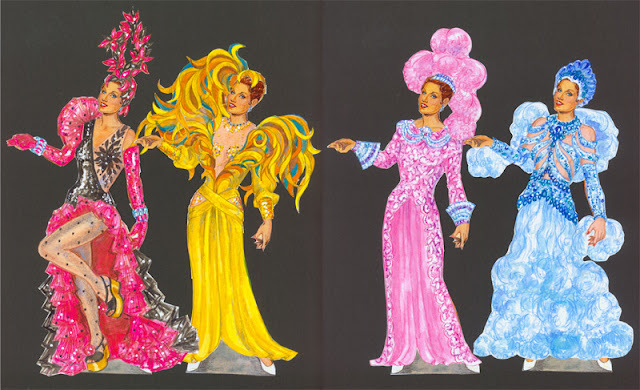 My new paper doll book includes costumes from all these non-glamour roles as well as plenty of the razzle dazzle that becomes a legend most. Joan Crawford and Irene Dunn in glamourous and not-so-glamorous costumes. Loretta Young and Bette Davis in glamourous and not-so-glamorous costumes. 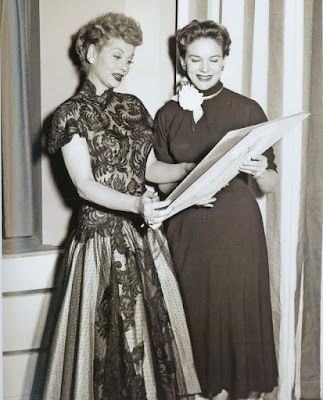 Greer Garson and Greta Garbo in glamourous and not-so-glamorous costumes. Christmas Window Shopping in London! 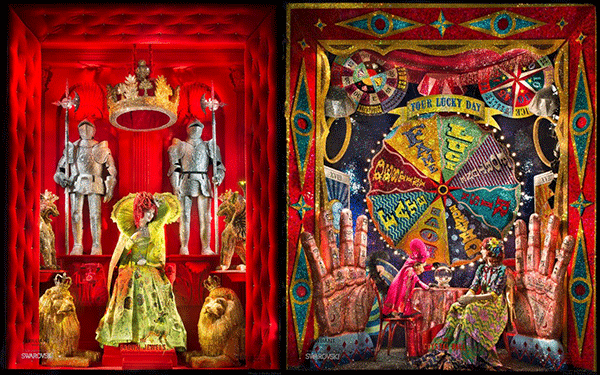 One of the holiday highlights for me is gazing at the displays in the windows of stores famous for eye-popping creative extravagance. In New York City, Lord & Taylor always gets my vote because it invariably inspires heart-warming nostalgia. This Christmas is no exception. In addition to creating a block long, twinkly evergreen grotto in front of the store, each window is devoted to a favorite thing and my favorite is the massive gingerbread house with a mob of gingerbread men. For cool (quite literally), it’s Barney’s “Chilling Out” window theme. A real, ice locker features a live sculptor hacking a block of ice with a chainsaw. 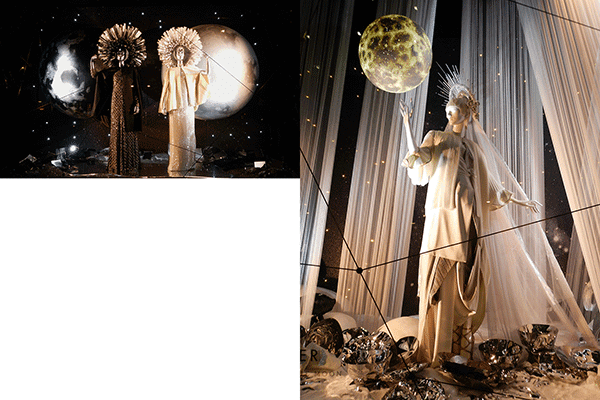 Saks Fifth Avenue is the most glamorous with high style ice queens and winter palaces. Macy’s gets the kid’s vote with a Charlie Brown 50th Anniversary wintry celebration. 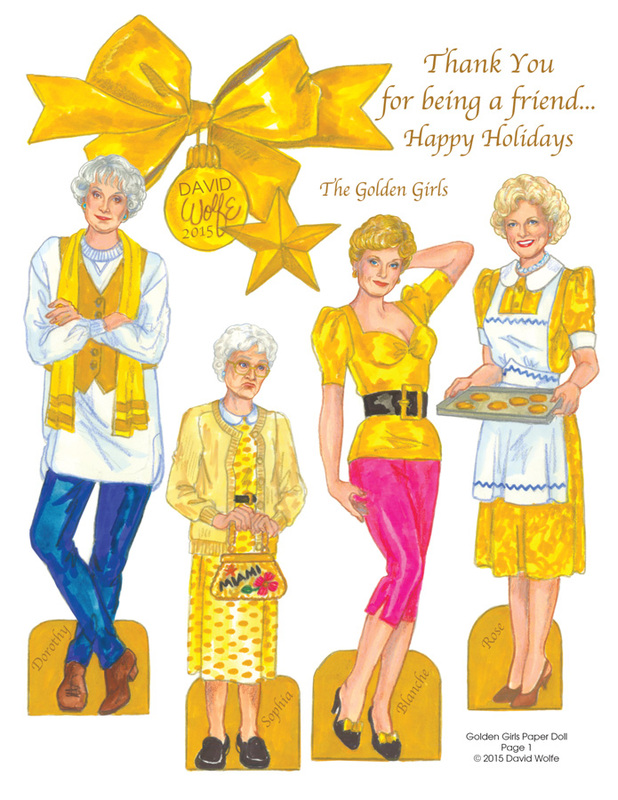 Dress Dorothy, Blanche, Rose and Sophia in festive outfits for the holiday season. Wishing you a Merry Christmas and a Happy New Year! 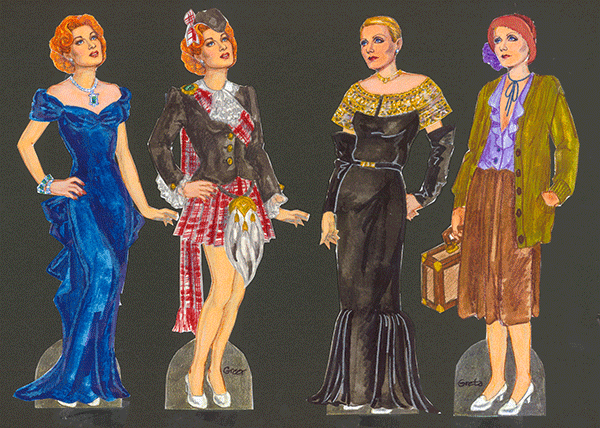 My soon-to-be-published Hollywood goes to New York City paper doll book is all about glamour. 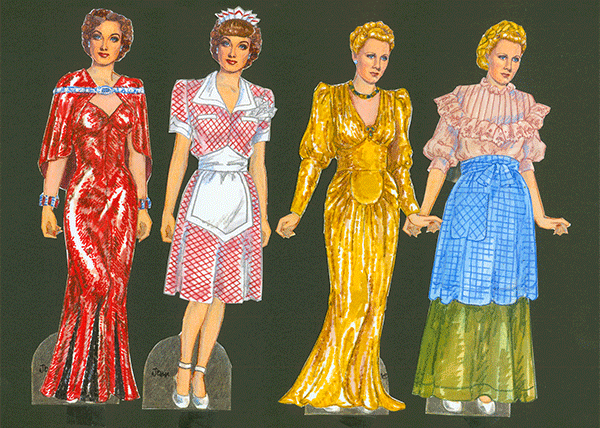 Eight pages of clothes for the four dolls are taken from movies set in the Big Apple. Of course I was happy to include extravagant showgirl costumes from Ziegfeld Girl, The Ziegfeld Follies of 1948 and The Great Ziegfeld. I also included one of Carmen Miranda’s costumes from Greenwich Village. I am not a card-player but I was delighted to receive a card game as a gift from my dear friend, Sharry O’Hara. “Fashion Face-Off” is a trump card game illustrated by Erin Petson. I was not familiar with the artist, but immediately became a fan of her wonderful technique that combines watercolor, collage and line to create fresh and free fashion illustration. Best of all, the sketches accurately capture the garments correctly. Each of the cards in the chic deck portrays a truly iconic modern fashion by designers like Christian Lacroix, Diane Von Furstenberg and Vivienne Westwood. Pick a card, any card. You don’t have to be a card-player to enjoy this charming example of imaginative fashion illustration. Available online from barnesandnoble.com, $9.95. 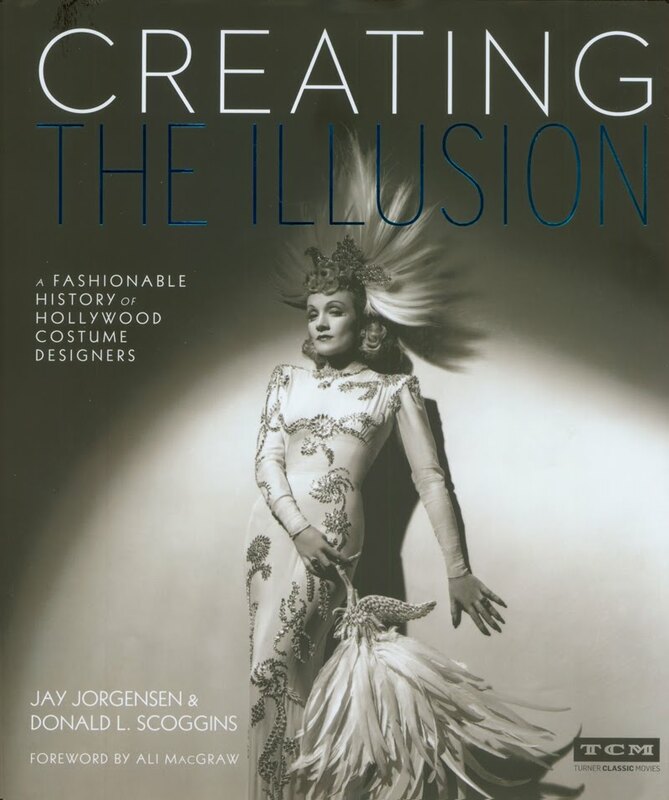 A recently published book, “Creating the Illusion,” is a great big gorgeous coffee table tome by Jay Jorgensen and Donald L. Scroggins. It is a gorgeous 415 page volume filled with rare photos and containing short bios of virtually every Hollywood costume designer from the silent era to present designers, from Erte to Coleen Atwood (Edward Scissorhands). Some, such as Adrian, are well-known, others like Elois Jenssen (I Love Lucy) are unsung, but all are important and their career trajectories are fascinating. Several tried to design for consumers, but only a few succeeded in the real world. Theirs is a special gift. Edith Head explained it when she said, “What a costume designer does is a cross between magic and camouflage. We create the illusion of changing the actors into what they are not. We ask the public to believe that every time they see a performer on the screen, he’s become a different person.” Creating the Illusion is available on amazon.com where the $65 price is discounted to $40.90. Ugly is the New Beautiful? Disruptive Style is In! 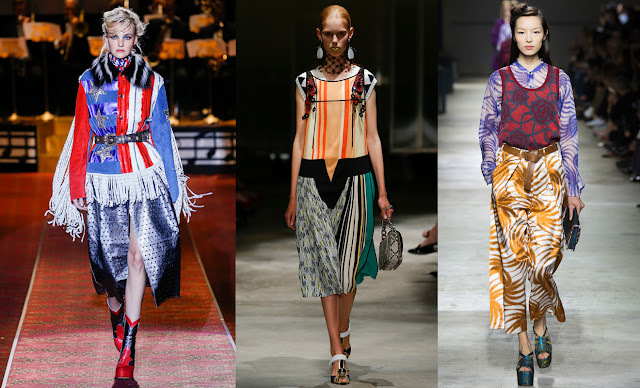 The recent trend-setting Spring ’16 fashion shows seemed determined to break the rules and turn style upside-down. And you can forget about “good taste!” Oh, there are some beautiful items and accessories, but they are too often put together in attention-getting, but downright ugly combinations that only a so-called stylist could envision. Prints and patterns are frequently mis-matched in chaotic combinations. Many designers won’t let go of the funky ‘70s, an era known as “the decade that taste forgot.” Appropriate accessories are a thing of the past. 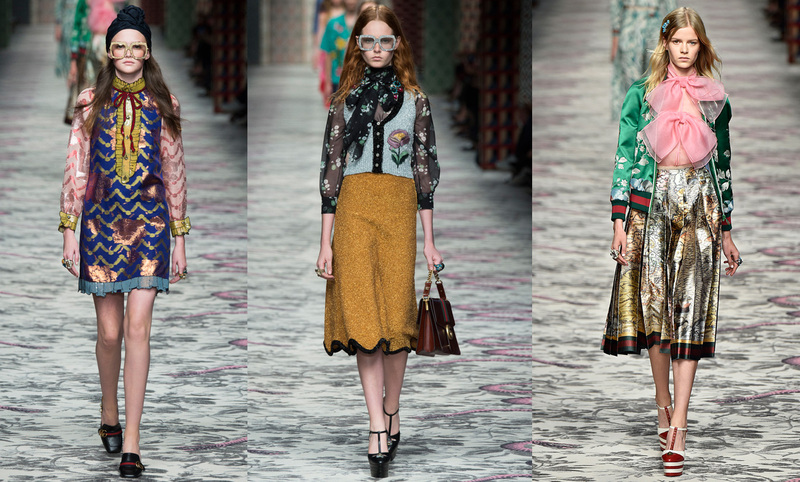 The leader of this renegade pack is Alessandro Michele, the Gucci designer who has become the designer’s-designer, much admired and copied. 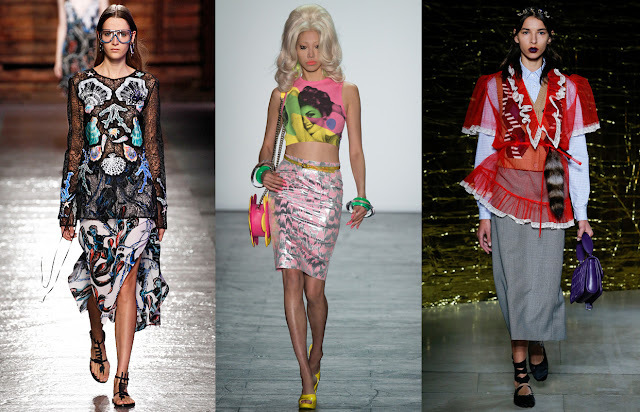 As a reflection of our society-gone-awry, this fascination with intentionally disruptive style is right-on. But will it step off the runway into real-life? Let’s hope not! 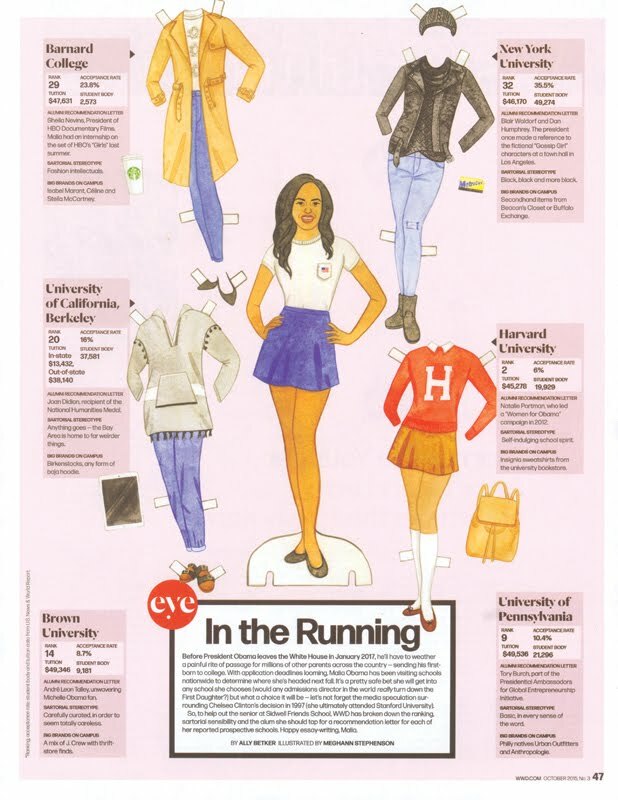 Malia Obama is about to go off to college and WWD, the fashion industry bible, featured her as a paper doll with individual wardrobe items for various universities. New York University cool, Harvard is traditional, Berkeley is far-out. This full page paper doll was illustrated by Meghann Stephenson. 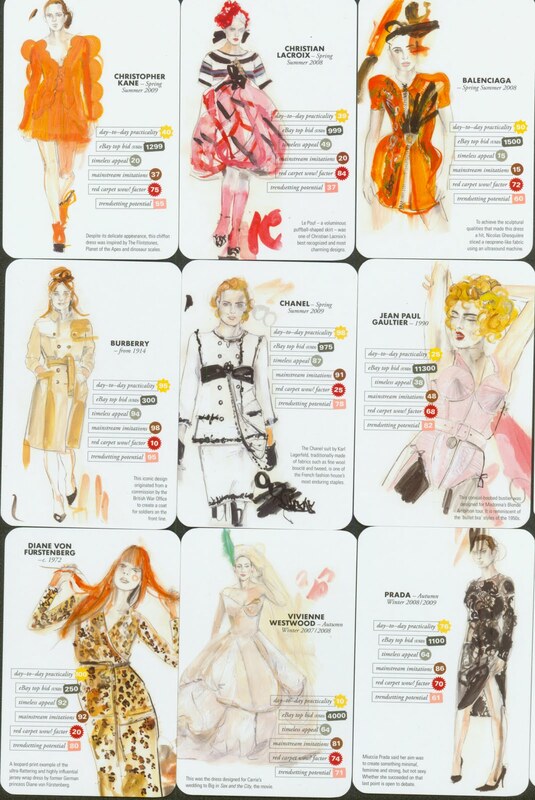 As a paper doll artist, I constantly battle my past as an illustrator of high fashion. Exaggeration and elongation are the lynchpins of fashion art and I confess that I often got carried away. Years ago, in London, I was known as “the artist who draws long American legs.” Height in drawings is measured by “heads” not feet or inches. The ideal real woman is 7-and-half heads tall. A fashion figure is usually taller, 8 or 9 heads high. Recently, I’ve seen illustrations as tall as 12 heads! The problem with such freakish elongation is that the design of the garment has to be reconfigured and re-proportioned to fit the super-tall figure. When that happens, the garment is truly misrepresented. 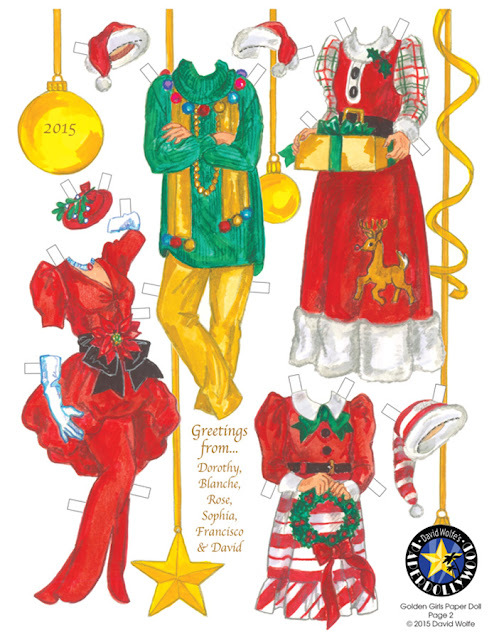 Paper doll artists, myself included, sometimes make grave errors in representing a celebrity properly proportioned. Very few are model proportion. Many big stars are very little people. (Liz Taylor was 5’2”, Connie Francis was 5’1” and Gloria Swanson was 4’11”). 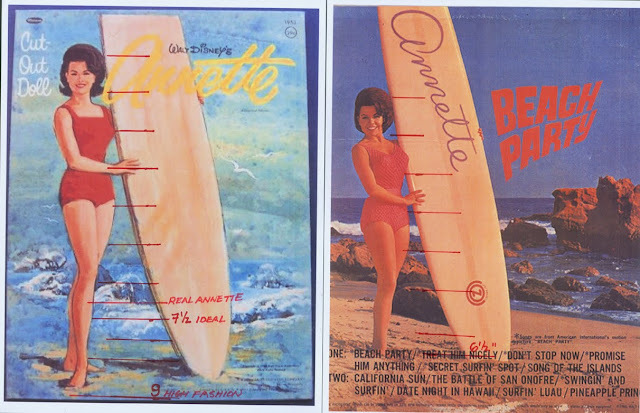 Example as shown: the height difference between the real 1953 Annette and the paper doll Annette. 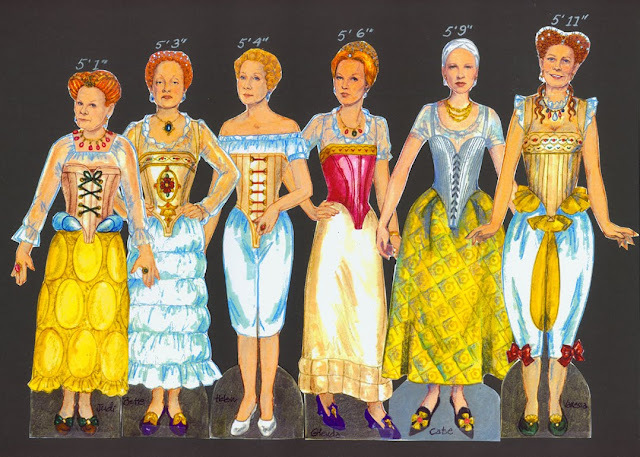 I’m currently working on six dolls who are heads apart in height, yet all of them portrayed Queen Elizabeth I on the screen and all acted their larger-than-life role impressively. So maybe size doesn’t matter, after all. But I was mindful of their height difference when creating the dolls for Queen Elizabeth on the Screen Paper Dolls to be published Feb. 2016 by Paper Studio Press. Judi Dench 5'1", Bette Davis 5'3", Helen Mirren 5'4", Glenda Jackson 5'6", Cate Blanchett 5'9", Vanessa Redgrave 5'11"